‘Does VPN slow down Internet?’ is a question that often bugs people and even keeps them from starting using VPN. However, the fear is overstated, as the Internet speed depends on a number of factors. When you connect to VPN, and your online traffic is routed through a secure encrypted tunnel, you may experience slight changes in the Internet speed, and this is absolutely normal. Let’s take a closer look at what determines the Internet performance when you access the web privately and securely instead of the regular, unprotected way. The distance between your location and a VPN server is one of the key factors determining the Internet speed. For example, if you’re in the UK and you’re connecting to a server in Australia, it is a substantial distance for a data packet to travel. So the nearer a server is located, the faster the Internet speed will be. Unless you need to connect to a server in specific location, it is better to choose VPN servers in nearby countries, including yours. To squeeze out the maximum, search for a high speed VPN service provider with broad country coverage and a large number of servers, such as NordVPN that offers 5194 servers in 60 countries. To see how the Internet speed differs when connected to servers in different locations, run a speed test and take a look at the ping time. It shows how long is a delay in the connection between your device and the server it’s communicating with. For instance, when connecting from the UK, choose an Australian server and run a speed test, then run it once again when connected to a server in France. Compare the ping times to see that the delay is shorter with the French server, as it’s way closer than the Australian one. So shorter ping times is what you should always look for. However, to determine the actual speed, interlinking between different ISPs must be taken into account. That means that the same speed test server must be used in both cases: when connected and when disconnected from VPN. Let’s say you live in the UK and you want to test the speed of your VPN when connected to a server in Germany. All you need to do is to connect to a German server and run a speed test. However, after you disconnect from VPN to run another speed test, you must choose the same speed test server in Germany you used in a test before. When there are many users connected to one server, the connection speed drops. Such overload is a typical problem with free and slow VPN service providers that offer a poor number of servers and have many users lured by the option of using VPN at no cost. Users of advanced VPNs with extensive servers’ lists shouldn’t face this issue. 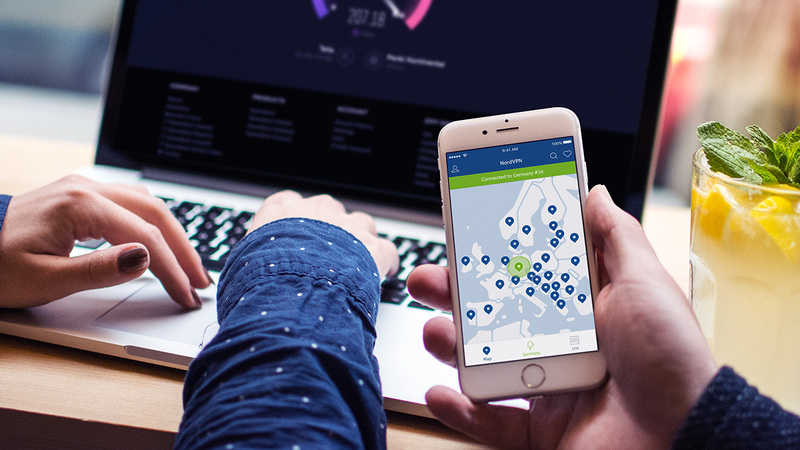 In NordVPN, the Quick Connect functionality comes in handy – it automatically picks one of our dedicated servers for the best speed VPN performance. Encryption is the key feature of virtual private networks. It makes your online traffic inaccessible to hackers and snoopers so that you can browse in ultimate privacy. However, the way encryption is handled depends on a VPN service provider. It can vary in terms of quality and reliability. Advanced Encryption Standard (AES) is the block cipher algorithm used as the current encryption standard. It may come in different levels of strength, such as 128-bit, 192-bit and 256-bit encryption. The higher the encryption level, the more reliable the protection of your data is. Before becoming the most frequently used algorithm in ciphering data, AES with 256-bit keys was used by the U.S. government to secure classified information and by the NSA to protect national security data. Even a supercomputer can’t crack 256-bit encryption, so the strongest type of AES is what you should be looking for in a VPN service. However, there is a small tradeoff you have to make: security and privacy supported by the strongest available encryption come with a slight loss in the Internet speed. So it’s a matter of your preferences: whether you need maximum speed or your sensitive data being protected against snoopers of any kind. Speaking of NordVPN, military-grade AES-256 encryption implemented into the IKEv2/IPsec and OpenVPN security protocols is used to provide users with the ultimate data protection. If your Internet speed is low to begin with, VPN shouldn’t be the only factor to blame for your online traffic running slow. Sometimes, Internet service providers (ISPs) throttle bandwidth on purpose. Users might experience this by their Internet speed slowing down for specific websites or at certain times. For you as a user it usually means that you won’t be able to stream videos or download content as fast as you normally could. In this situation, VPN comes as a true lifesaver – by routing your Internet traffic through a virtual private network, you can bypass the speed limitations imposed by your ISP. Running a simple speed test will show how connecting to a VPN affects the performance and whether VPN slows Internet. To run a test for NordVPN, we used the Ookla service for speed testing while connected to Wi-Fi. When connected to a recommended server via the auto-connect functionality, which picks an optimized server according to its load and geographical proximity, we notice a slight decrease in the download and upload speed. When continuing to experiment by connecting to servers in geographically more distant countries, we get varying results depending on a server location. Generally, it all follows this rule: the less distant a server is, the less the Internet speed drops. So as you can see, the server location plays one of the main roles in speed performance. In most cases, if you use VPN for simply browsing the web, you will experience little to no drop in the Internet speed. If you use VPN for watching video content securely, you might be interested in ways how to make streaming faster. In this case, we recommend connecting to special servers optimized for secure streaming. Also, you can try out the tips how to increase VPN speeds. In the end, VPN isn’t made for making your Internet connection faster. Instead, VPN is all about security, privacy and opening possibilities offered by the Internet. Slight drops in speed are absolutely normal, and it’s a very small sacrifice to make for enjoying ultimate privacy and security online.